PBS is sometimes the ONLY access to educational programs poor children have before they start school…NOT unnecessary. Rmoney’s problem with educational TV is that it’s, well, educational. He knows that an educated electorate is not exactly the GOP base. My opinion is there are other ways to cut the budget without hurting our children enough said…. It’s sad that we feel the need to use innocent children to further our ambitions. I love PBS. It’s great. I think the government should give them money, and Romney was silly to have said anything about it at the debate. That’s not what I found interesting . What was interesting was the perceived value of this kind of media for children. There were 2 types of comments to this letter: “hurting our children/using innocent children/only educational programming that poor kids get” vs “parents should teach kids to read themselves and/or get the dvds from another source (ie the library).” Most of these people believe kids NEED Sesame Street for educational purposes, presumably as a preschool substitute or supplement. I don’t believe that kids NEED Sesame Street, but if a kid’s going to watch TV, Sesame Street is probably the best choice for programming that we have. Again, I grew up with Sesame Street and I think it’s great. I learned all about near and far from Sesame Street. But it should only be one little part of a child’s literary education. If these people are truly concerned about a child’s access to educational “things,” they should be squawking about how libraries and schools are horribly under-funded, not about proposed cuts to television shows. The “he wants to hurt our children” reaction is one that comes from an emotional place, and it’s a myopic view. About the person who says kids don’t watch or understand the debate because his/her cousins would prefer Pokemen (logical fallacy much? ): I included that because that person’s a noob and obviously doesn’t know anything about children. 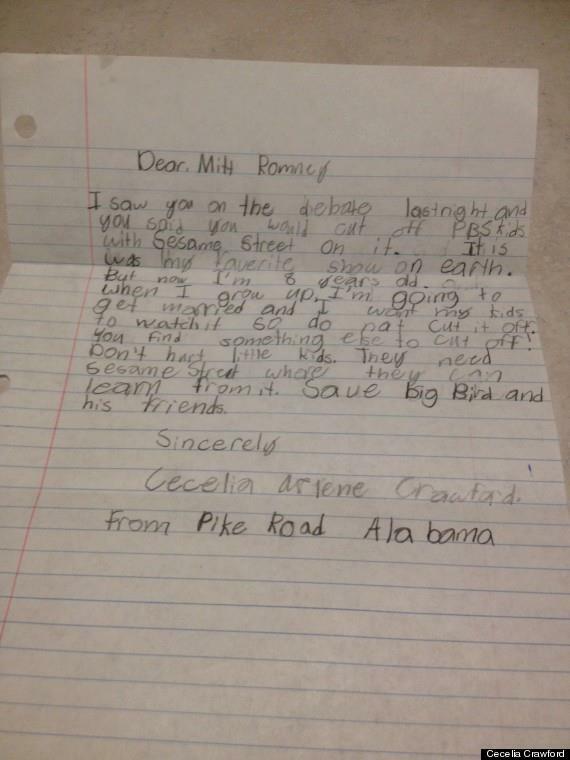 Kudos to the parent who gave Cecilia a pencil and paper and supported her right to express her opinion. Posted on October 4, 2012, in Uncategorized and tagged Sesame Street. Bookmark the permalink. Leave a comment.